Khrushev famously quoted: “We shall bury you”. He didn't. Communism died in the USSR, and the USSR fell apart. So Khrushev failed to bury the USA, except perhaps indirectly. We have buried ourselves. It's the little stuff that does it. This is the first of a series of articles on the causes of the eventual collapse of capitalism as we (and our parents knew it). Remember this? In the Summer time, the Good Humor truck drove by with these tasty treats. You could save the sticks and weave them into rafts and construct buildings on rainy days. Supposedly, popsicles were invented by an 11 year old boy who eventually patented the recipe and sold to a New York company. 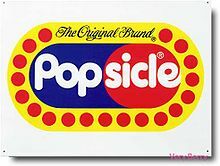 On recent years, whoever owns the original popsicle, including the trademark, is ultimately owned by Unilever in New Jersey, the owner of other fine companies (Dove soap, Axe deoderant, Ben and Jerry's...). What does Unilever know about producing any of these products? Nothing. Unilever is a holding company. Their mission is to make money for their shareholders. That is what capitalism has become. Now, something has happened to our Popsicles! They are tasteless. “Less than 1% fruit juice”. The first noticible change was in June, 2013. Popsicle is still owned by Unilever, but customer service claims that nothing has been changed. The loss of a quality Popsicle may not seem to be a major indicatorof the collapse of our economic system. But lump this failure together with others? Start paying attention to the little stuff.